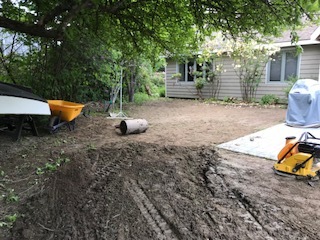 Check out this regrading project we did for a back yard in Dover NH. As you can see, there was a lot of work to be done! 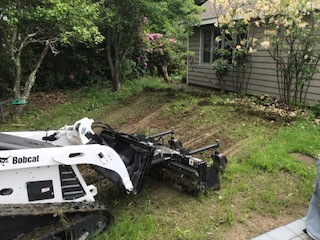 Luckily, we have the right equipment and the dedication to our clients that makes us the go to regrading and excavation specialists in the Seacoast NH area. As you can see, the before and after shots are incredible. The backyard is now as level as it can be. Any time you dig, you want to be sure you are doing it safely and it the right way. That is why calling us is your best option! We have been doing excavation work for both residential and commercial clients for a very long time. We are well equipped to tackle your next project. We understand you are a lot of ideas for your home, and sometimes these projects are necessary to ensure your property is functioning at it’s best. In order to make sure it is done the right way the first time, give us a call. Call us ASAP! You’ve worked extremely hard for your home, and we value the opportunity to make your home your dream home. Starting a new project is exciting and nerve wracking. We are here to make the process easy and simple. As a fairly priced construction company specializing in excavation and home repair and rehab, we’re here to make your life easier You can call us today or contact us by filling out the form below.